This post is brought to you by Daisy Squeeze Sour Cream. Squeeze more out of the holidays with a #DollopOfDaisy. We couldn’t be more passionate about today’s meal! First, Mexican food. We just love it the very most. Second, miniature size. Shrinking food down is a sure fire way to get our kids pumped about it. And third, is it weird to absolutely love sour cream, because we do. We LOVE you Daisy. And just when you thought it couldn’t get better, they whipped out this super convenient squeezable tube! First up, Nacho Bites! These are great as an hors d’oeuvre because they’re bite size and single serve. People can make their own, or you can pre-assemble and put on a platter! We simply piled up black refried beans (we like these combined into a paste so they don’t roll off! Then your favorite seasoned meat – we did a sweet pork for these (all recipes below!) Pico De Gallo, shredded cheese and fresh avocado! Put them under the broiler to get nice and toasty and then top with Daisy Sour Cream! The spout on this tube has the perfect split insert so you can really control how much comes out and even design the shape. Trying to keep the Sour Cream clean and free from other ingredients is no easy task, and we love that this comes out fresh every time!Then what kiddo doesn’t like a quesadilla? 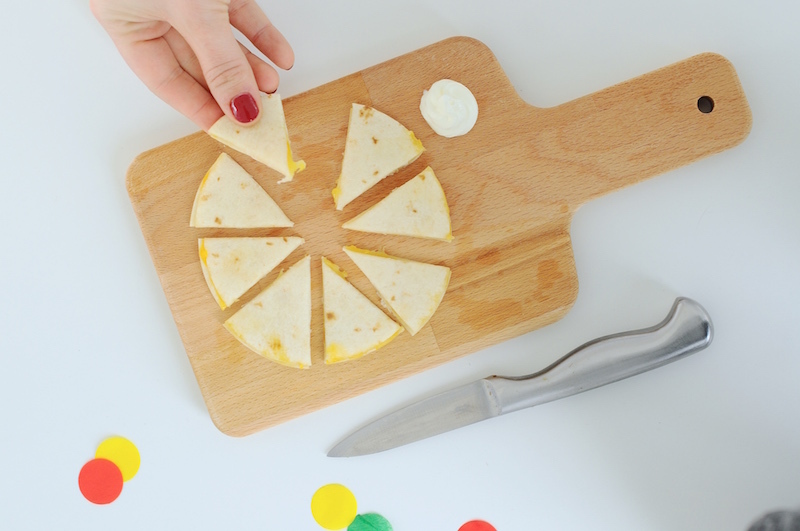 To make it special for our Mini fiesta we took a circle cutter to make the quesadillas mini – this set is so fun! 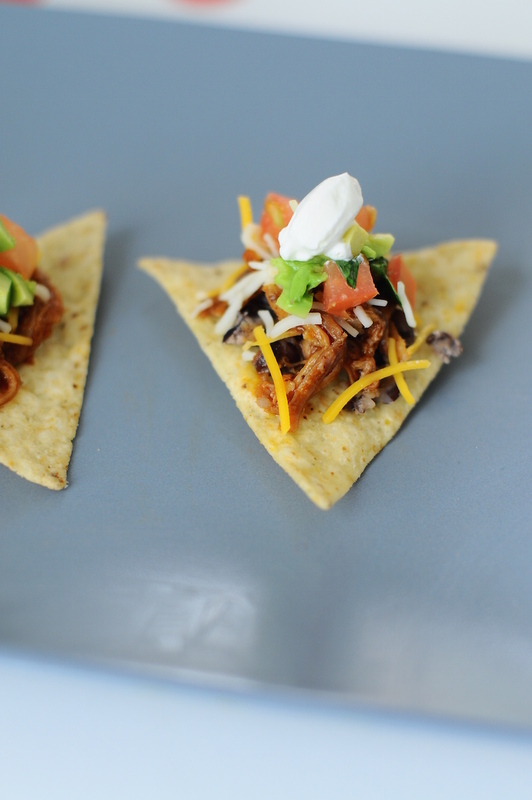 Everyone gets their own mini and can add whatever toppings they love from the Nacho Bites stations. And now as promised, recipes! Grease your crock pot and then place your pork and one can of cola. Season generously with kosher (1/8 tsp.) and garlic salt and cracked black pepper. Cook on high for 6 hours or until shreddable with a fork. Pull pork out and shred, then put back in the crock pot. Blend or Food Process green chiles, enchilada sauce and 2nd cola can and pour mixture over shredded meat. Cook for 2 more hours on low. 1/2 a fresh jalapeño de-seeded and diced.